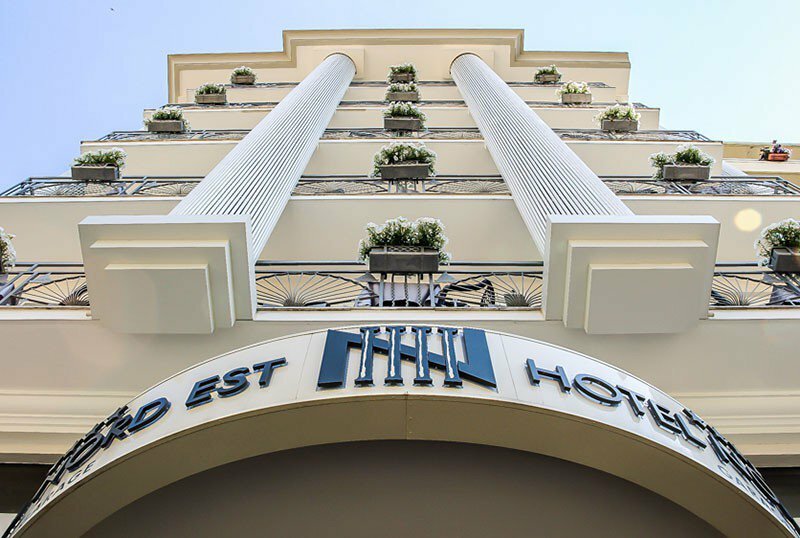 The Hotel Nord Est of Gabicce Mare is a 4-star family-run hotel located on the seafront and just a short walk from the center. It has 2 private beaches with swimming pool, children's pool and hydromassage, WI-FI connection, garage with parking spaces for all guests, bicycles, services for children and the disabled. Free small pets. The hotel is located in the center of Gabicce Mare, in front of the beach: it overlooks the seafront on one side and on the other on the via Veneto promenade, full of shops, ice cream parlors and restaurants. In addition, the location is convenient for both Cattolica and Gabicce Monte, both locations are less than 10 minutes away by car. The hotel has rooms, suites and apartments. The rooms measure from 13 to 65 square meters. Recently renovated, they are elegantly furnished and have a balcony or loggia with sea view, beds with orthopedic mattresses, LCD satellite TV, minibar, safe, telephone, afternoon tidying, air conditioning / heating, WI-FI high speed connection, bathroom with shower box or hydromassage bath, magnifying mirror for make up, scale, hairdryer and courtesy set. The suites are located on the attic floor where they enjoy a splendid view of the sea. All have satin linen, separate bathrooms with shower or hydromassage. You can request daily newspapers and breakfast in your room. FAMILY LUXURY SUITE : can accommodate up to 6 people, is a new accommodation with terrace and panoramic views. It has 2 bathrooms with emotional showers. CHIARDILUNA SUITE : spacious room with terrace overlooking the sea. DOLCEVITA SUITE : has a private mini-pool and separate bathrooms with emotional showers, is characterized by large windows overlooking the gulf. BATTICUORE SUITE : has a terrace overlooking the sea, a private mini-pool with hydromassage and glamorous furnishings. There are also two-room apartments (with living room with kitchenette, balcony, bedroom and bathroom) and three-room apartments (with two bedrooms). Large open-air porch and relaxation area, free use of bicycles (also mother-child tandem), reading room with newspapers in consultation, lift, laundry service on request, beach towel, theme nights. The property has 2 private beaches with swimming pool, Jacuzzi and many services for children. PARKING: garage spaces available (half board, full board, All Inclusive). WI-FI : high speed and free, available throughout the entire hotel and on the beach. SERVICES FOR PEOPLE WITH DISABILITIES : ground floor entrance, standard elevator, room with wheelchair maneuver space, accessible shower and shower chair. BREAKFAST : served buffet style, in the restaurant on the private beach, with sweet and savory specialties. LUNCH AND DINNER : meat, fish and vegetarian specialties with 4 menus to choose with a buffet of appetizers, vegetables and desserts. Schedules are flexible. VARIATIONS : vegetarian cuisine. On request: vegan and celiac cuisine. In the hotel: outdoor playground area, strollers, baby-phone, bike with baby seat and mother-child tandem, corner of fairy tales and cartoons, kids club with playground and entertainment. Available upon request: bottle warmer, pediatrician and baby sitter. In the room : cots on request, cots also with anti-fall edges. At meals : high chairs, flexible hours, dedicated menus and room service on request without supplement, milk, homogenized, baby food and afternoon snack. 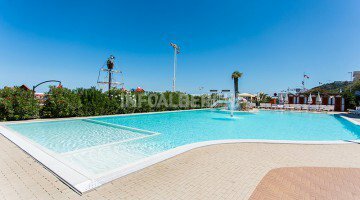 At the beach : swimming pool at the beach with separate children's pool (maximum depth 60 cm), nursery, playground, baby / mini / junior club. The hotel has an agreement with the Banana Beach and Banana Chic, which have a swimming pool, bar, restaurant, gym, fitness area, nursery, library and beach volleyball courts, table football and table tennis. The pool is equipped with a hydromassage bath and a separate area for children (the children's area has a degrading height from 20 to 60 cm). Swimming and aquagym courses are now available. The basic services include hot showers, sunbeds and beach umbrella (each umbrella includes 20 square meters of reserved space). The little ones have at their disposal playground areas and entertainment service.